The other day I was watching The Iron Giant. Now, this is basically a family movie about a giant robot from space that lands on earth and is damaged so it can't remember its purpose. This movie is overall a fantasy, and it doesn't worry me too much when it does odd things like have the robot eat metal. There was one thing that was bad enough to throw me a bit, and that was when the Robot heroically saves the town from the nuclear weapon at the end. Overall, I quite liked this scene, it showed the basic insanity of what was going on, and the self sacrifice was a nice touch, and I tend to think they did a very good job with it. It does bring to light one slight misunderstanding people have about how nuclear bombs work. Unlike conventional explosives, nuclear bombs won't be set off by an impact event as was shown in the movie. In general, there are two types of fission warheads. The first type of warhead is what's called a gun-type warhead; basically you have two slugs without enough mass to go critical, but when brought together go supercritical and you get a large explosion. This type of nuclear bomb would, in fact, detonate just as was depicted in the movie. The other type of nuclear warhead is what is called an implosion type nuclear warhead. It uses much less fissile material, and instead has a series of explosive lenses which, when detonated very precisely, cause the fissile material to compress and go supercritical producing a nuclear blast. By 1957 the United States had switched to using almost entirely compression style nuclear warheads due to the fact that they use less fissile material, and are much safer to operate. Further, I was unable to find a single instance of the United States using a gun type warhead in a nuclear missile, they were only put into gravity bombs. Crashing into the side of one would almost certainly destroy the explosive lenses and prevent a supercritical explosion. 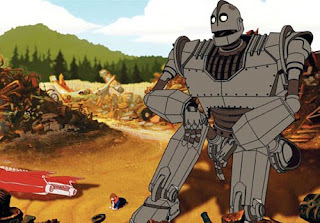 So, what does this mean for The Iron Giant and other movies of its type? The giant might have been blown apart when it destroyed the warhead due to the small explosions of the lenses inside the warhead, but there would not have been a nuclear blast as depicted. This is, admittedly, a very minor nitpick, but it was severe enough to pull me out of the story when it happened, so I thought it was worth mentioning. 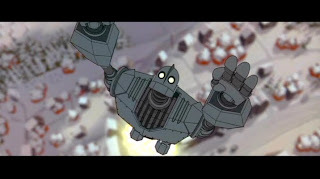 The Iron Giant was an excellent movie though, and I recommend you watch it if you haven't.